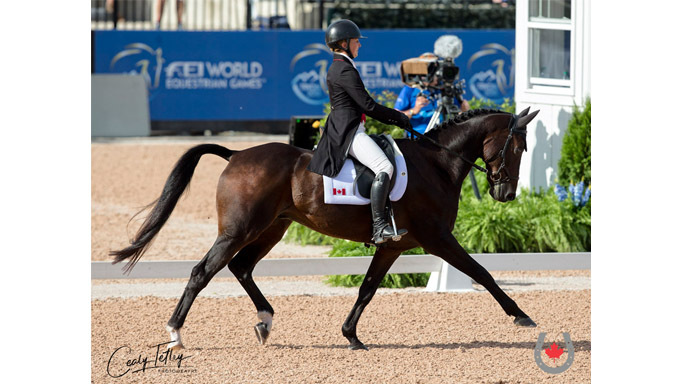 Mill Spring, NC – The Canadian Eventing Team wrapped up the dressage phase at the FEI World Equestrian Games™ Tryon 2018 (WEG) in Mill Spring, NC on Sept. 14, 2018, and is currently holding 13th place heading into the cross-country phase on Sept. 15. The team, comprised of Lisa Marie Fergusson of Langley, BC, Colleen Loach of Dunham, QC, Selena O’Hanlon of Kingston, ON and Jessica Phoenix of Cannington, ON rode to a team score of 98.10 penalty points. Germany is currently in the lead with 73.40, with Great Britain in second on 80.80, followed by the United States in third (83.00). Individually, Julia Krajewski of Germany is in the lead with 19.90 penalties aboard Chipmunk FRH. On the opening day of the eventing dressage phase on Sept. 13, Fergusson and Loach put forward team scores of 40.20 and 34.40 penalties, respectively, while Hawley Bennett-Awad of Aldergrove, BC had a strong performance competing for Canada as an individual to start with 32.70 penalties. 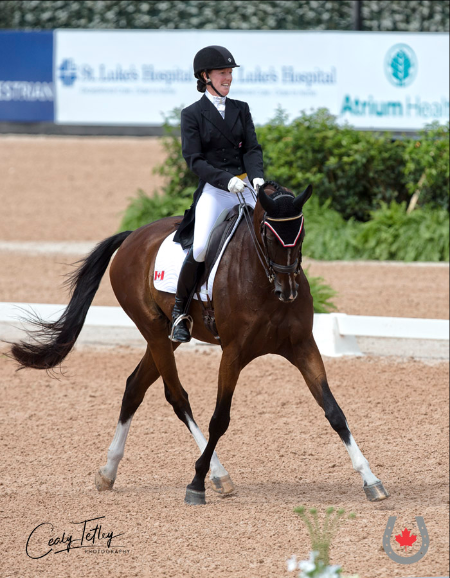 Riding in the anchor position, O’Hanlon proved to be Canada’s highest-placed dressage finisher, currently sitting in 37th with her long-time partner, Foxwood High, a 15-year-old Canadian Sport Horse gelding sired by Rio Bronco W and owned by John and Judy Rumble. A strong test, highlighted by scores of 7.7 for multiple individual movements including flying changes, extended trot and collected trot, gave O’Hanlon and Foxwood High (affectionately called Woody) a score of 30.70 penalties. O’Hanlon has come into WEG 2018 following stellar seasons with Foxwood High in 2017 and 2018, including a historic moment as the first Canadian to win the CCI 3* Fair Hill International in 2017, and a CIC 3* win at the renowned Bromont Olympic Park just prior to WEG in August 2018. Another veteran pair, Phoenix, 34, and her Westphalian gelding, Pavarotti (Pavarotti van de Helle x Foxiland), will head into cross-country on a score of 33.0 penalties. The Canadian Eventing Team will move forward into the cross-country phase on Sept. 15, followed by show jumping on Sept. 16, where team and individual medals will be awarded.